We all want a healthy, functioning brain for as along as possible. How we eat and drink really does impact it. Studies on cognitive function and brain health show that overall a wholefood plant-based diet with a limited intake of animal and high saturated fat foods is the way forward. A big piece of research on this is call the MIND diet. Researchers at Rush University Medical Center in Chicago created the MIND diet – this identified food groups and nutrients from the Mediterranean diet and the DASH diet that had been linked to lower risk of dementia. Over 900 older men and women’s diets were analyzed and people who stuck closely to a MIND diet were 53% less likely to be diagnosed with Alzheimer’s over the 4.5-year study period, compared with people who adhered least to the diet. See you can see that a brain healthy diet really does go along the lines of a Mediterranean diet and general healthy eating. Other research on 447 adults showed that they performed better in cognitive tests after four years on a Mediterranean diet compare to a control diet. 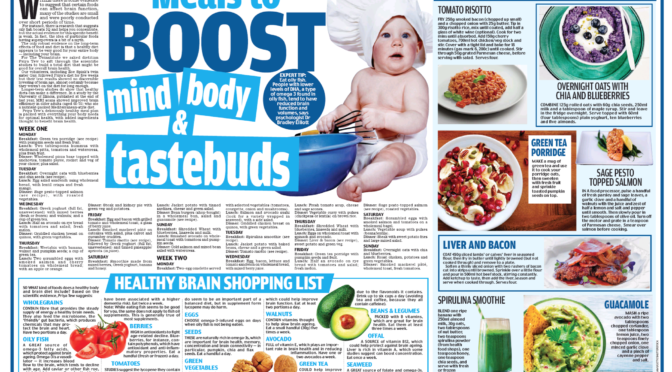 ​Here is my meal plan published in the Daily Mail as part of Twinstitute for BBC2. Let’s dig a bit deeper….there are some specific nutrients that have been highlighted as improving cognitive function. B vitamins and folate : shown to have a link to improved cognitive function, possibly by decreasing homocysteine levels. The evidence is not robust but suggestive. For example a study on elderly people with an increased risk of dementia showed that high doses of B vitamins slight brain shrinkage over 2 yrs. Specifically looking at vitamin B12, cohort studies have suggested that dementia rates are highest in those with a lower B12 status. Omega 3’s: the brain comprises 60% fat and is one of the fattest organs in the body. With such a high percentage of fat in the brain it’s no surprise that fatty acid’s are important nutrient. Specifically we need to know which fatty acids are important. The research we have suggests that it is the omega three fatty acid‘s to focus on. These have the potential to slow cognitive decline. Fit to focus on therefore our fish, shellfish, algae and the plant foods walnuts, linseeds and chia seeds. Antioxidants including Vits A,C and E: Oxidative stress is one of the primary reasons are brain function declines. Therefore antioxidants are of upmost importance. This brings us back to the good old fruit and vegetables once again proving that we just need to be eating more of them. 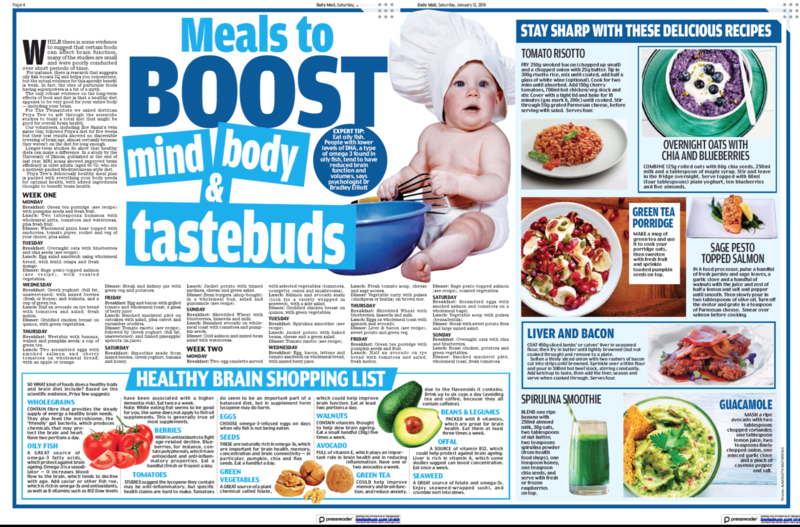 There has been some research looking specifically at berries and berry juice linking this to increasing memory scores, also the famous avocado for its vitamin E content. Similarly flavonoids found in red wine, dark chocolate, green tea can also help fight oxidative stress. There are some small scale, low power studies that look at blueberries, green tea and red wine that suggest these can be helpful. We have some limited research suggesting that nut intake (specifically walnuts) is associated with better brain function. This fits in with the Mediterranean diet, they contain antioxidants including vitamin E and so it makes sense. Water: about 75% of the brain is made up of water therefore dehydration even in small amounts can have a big affect. Therefore staying hydrated is key. So top foods to eat more of? And then a little of the red wine plus dark choc makes a perfect combination.